A really neat thing about full-time RVing is our ability to live in our RV anywhere on the continent for however long we want (more or less). There are, we think, more places to try than we could sample in thirty-five years or more. In fairness we might need to try and stay a shorter time each place, maybe like Rob and Jan did in their very cool tour of 50 national parks, the original Sprinter Tour. We do our best and find ourselves sticking down roots for weeks and sometimes months in favorite places. Gosh, before you know it we could up and buy a lot and find a builder and start roughing in utilities even! Nah! Been there, fooled that already. We really do want to keep sampling around and are excited about all the places we haven’t even seen. Two and one-half years ago we tried TowerPoint Resort in Mesa AZ upon invitation from full-timers Bob and Faith. We knew them from attending WBCCI “Internationals”, airstream annual meetings. We’d had fun with them and accepted their invite to try out this place in Mesa for a month. A month turned into six weeks so I could compete on the club’s team in the East Valley tennis league. A year later we committed for three months of winter at TowerPoint. Between flying back east for a wedding then a high school reunion then family Christmas we only spent six weeks at TowerPoint. This year we committed for five months. Wow, that’s a big deal for us. We hadn’t stayed anywhere five months since we started on this odyssey almost five years ago. And we did get itchy feet midway and towed our home into the desert at Quartzsite AZ. Worth it, preserved our sanity and maybe our reputation for being travelers still. Even after five months stay, we do love Mesa and the resort. We promised to tell the three best things we’ll really miss about the West and why we’ll look forward to getting back there this autumn. The following are not in any particular order, they are the top three favorite things we think about Mesa AZ. We’re still eating avocados, oranges, and grapefruit from Mesa AZ. We had these freely available all winter and they keep well too. Avocados are between $0.33 and $0.88 all the time for nice-sized ones. Oranges and grapefruit were free to us throughout most of March but were between $0.25 and $0.35 each at the stores. We’ve not eaten better ones either. We’ll look forward to all the fresh produce at Superstition Ranch Produce across from TowerPoint Resort, the fresh veggies, bulk foods and fun lagers at Sprouts Supermarkets, and the general groceries at Fry’s. Our friends. Sure, we are lucky to make friends everywhere we go. We have found true what so many others also learn about resort community life. We share so many activities on daily basis, whether playing tennis or learning a foreign language or just enjoying the weather together. The always sunny and almost always warm weather has a lot to do with how this works at TowerPoint Resort — we have countless opportunities to meet and greet and talk with our friends and neighbors. We enjoy it and can see in the faces of so many people how much they enjoy it too. Winter tennis in the southwest can’t be beat. There are more opportunities to play than anyone can take advantage of. The weather is incredibly cooperative — one of our sixteen weekly matches was rained out and we rescheduled and played it four days later. Yes, sixteen weeks of matches and we had one rain-out for my team. Our courts are lit so we can play until 10pm if we want. 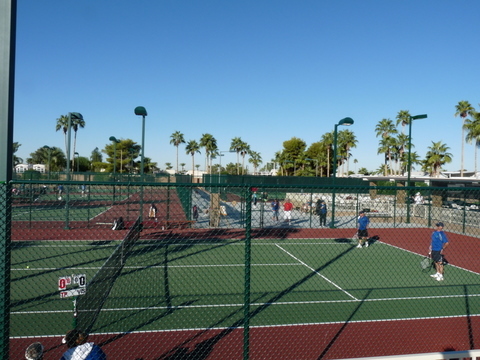 We have two hundred members in our resort’s tennis club and thousands in our East Valley tennis league. Finding a game is always a cinch. Even easier is finding enjoyable tennis to watch — our club has scheduled team matches every morning Monday through Friday November 10 through March 10. We try to play tennis year-round. But this is like living at the tennis club — our house, when we’re parked at TowerPoint, is less than 100 yards from the tennis complex. Tennis doesn’t get any more inviting or easy to engage in. We’ll look forward to the nice tennis club, the facilities, and the great people not only in the tennis club but in the entire resort. There are many more reasons to love living in Mesa AZ. If we told you more than these three reasons then you would want to move there and it might get crowded. Besides, I’m already over 750 words. Good night. It’s great to be here and Jim’s especially thrilled he’s back in tennis-land. We’ve been all over the place in the last couple of weeks, a little above our normal pace. It’ll be nice to stop awhile in Mesa Arizona. We’ve traveled 4,000 miles in October. Most of the miles, thankfully were via American Airlines. We drove from Washington state’s Long Beach peninsula to Boise to Ketchum/Sun Valley to Mesa, flew to Charlotte then drove to Lynchburg to Charlotte and flew back to Mesa. Can you believe we still feel a little inertia? We’re ready to settle down long enough to play some tennis and collect ourselves. Early last week we left sunny and cool Ketchum (Sun Valley) Idaho for our long drive to Mesa. We broke the 980 mile drive into a long day and a shorter day by stopping in southeast Las Vegas the first night. The former Holiday Travel Park (and decades before that, the Holiday Inn Travel Park) is a pretty nice place to stop over or stay awhile. The Las Vegas RV Resort (their current name) is located ten blocks from I-515, so it was easy enough to get outta there Monday morning. Getting there from the north wasn’t so pretty — we followed the gps routing and ran five miles of very busy four-lane city streets with poorly timed traffic signals and lots of construction lane narrowing. Take I-515 to Flamingo or Boulder Rds if you go. Our route from Idaho could have been, like last year, through Salt Lake City or through Nevada. A lot of the Utah drive was fantastic, especially the southern parts. We spent a lot of time in Utah earlier this year and wanted something new. We had over-nighted in all the western states except Nevada, so decided to see new things this time. Bob had given us great advice on roadside stopping places north of Las Vegas but we had our mileage hats on, it was Sunday, and we decided to clear Las Vegas before we stopped. The plan worked great — we left Las Vegas around 09:00 a.m. on a Monday morning and had very little traffic until one mile past the Hoover Dam. Construction on the new bridge bypass highway caused us a traffic delay of 1.2 hours. Had we waited another few days to travel this route the new bypass would have been open. 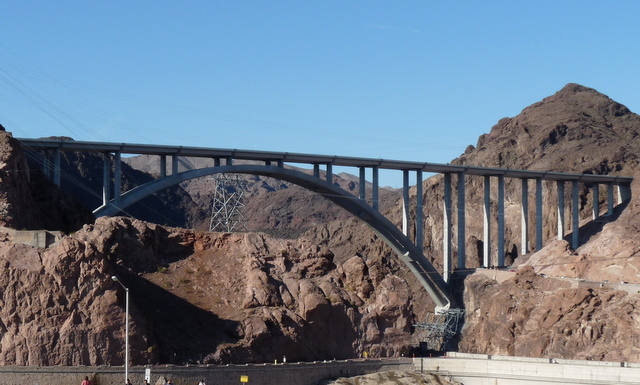 But then we might not have driven across Hoover Dam and seen it and the new bridge high above it. Pretty neat, and next time we’ll probably try the new bridge. We neared Phoenix a few hours later. Monday evening we parked in TowerPoint Resort within earshot of the gorgeous tennis park (all five courts newly resurfaced, new lights, new vinyl-coated fencing, and a great ramada overlooking it all.) Wednesday morning last week we hitched a ride to the Phoenix airport (thanks, John!) and flew to Charlotte. Our first task was to shop for wedding clothes — in our storage boxes. We carried our storage inventory (on our Mac) and hustled Thursday morning to the storage unit. The mission was planned long in advance and we had done our homework. We knew a document we needed was in a certain numbered box. We knew where the clothes would be (that’s especially simple, there’s only one clothes wardrobe and one clothing tote). We are delighted the document was in its appointed box and we were able to find clothes for attending the wedding and attendant functions. Coolest though was to test, for the first time in three years, our ordering of the boxes in our little storage unit. The space is five feet (5′) by seven feet (7′) and nine feet tall. We arranged 35 boxes according to the weight and the likelihood of accessing their contents. The dreaded scenario is a hunt for something in a bottom box anywhere, particularly in the back corner of the stack. Sometimes an adjacent storage unit is empty. Especially sweet is when the one across the hall is empty — we just open that door and stack a few boxes in there so we’re not working in the corridor. Imagine stacking 20 boxes in the corridor while we dig for something at the bottom of the stack? Moving all those boxes and totes would require some hard labor and an hour or two. And really great stacking in the hallway, all the time hoping the guy doesn’t need that storage unit behind your temporary stack. The past week’s travel to North Carolina and Virginia marks the first time in three years we’ve abandoned our silver home on wheels. Thanks to Bob and Faith for loaning us a suitcase, our carry-on stays in the storage unit since there’s really no place to stash it with us unless we strapped it onto the truck. We felt strange and sad locking up the trailer last week to go to the airport. Never mind the nagging questions like: did you turn off the water heater? did you stop the newspaper? did you empty the washing machine? did you kennel the dog? what if the sump pump fails and the basement floods? Oh, never mind, those are from the old house. Our questions now would be: are the roof vents on automatic so they’ll close in even of rain? are the windows latched except for the one to allow ventilation? is the water off? There, that’s simpler. And we hit all the marks on our list. But we still hated leaving our home for the first time. We left a set of keys with the park office and gave our neighbors our personal card so they could call us if the house burned down. Three nights ago we flew American Airlines from Charlotte to Phoenix after attending the wedding of Jim’s nephew. We flew from Mesa to Charlotte, drove to Lynchburg for the day and back to Charlotte again. The wedding, a fabulous social event, was in Lynchburg Virginia. 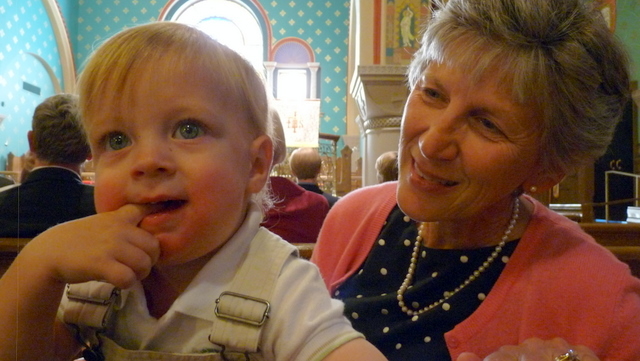 Jim’s mom, brother, and two of three sisters also attended. It was really nice to see family and friends. Even for full-timers, there’s no place like home, wherever you park it. We’re glad to be back in our own digs.